BlogBusinessHow Much Does Great Customer Service Matter in Your Business? How Much Does Great Customer Service Matter in Your Business? Coming back from a business trip this week, I realized it had been more than a year since our partnership with Amazon and the Connect team started. It’s incredible how much has transpired in a year and absolutely stunning the amount of welcome and reception that the platform has received from the marketplace. At launch, I thought early adopters would primarily be comprised of aggressive SMB organizations eager to adapt and adopt the latest new toys in the industry. Consider myself stunned that more than ever anticipated, early adopters have been largely comprised of big time Enterprise. And by that, we’re talking the biggest of the bigs – top 5 banks, top 5 insurers, top 5 financial service companies, top 5 retailers…..it’s truly been stunning. Like any new product launch, the past year has been full of amazing learnings, unexpected bumps and bruises and tons of pleasant surprises that provide enough motivation to make the adventure worth the taking. As part of a quick year in review, I thought it would be worthwhile to re-assess and emphasize the key benefits that we are seeing Amazon Connect bring to the marketplace. 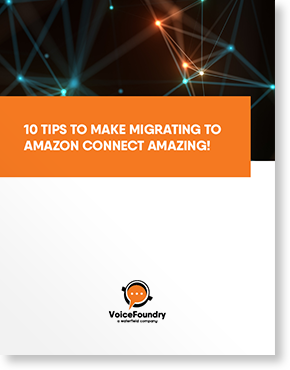 Many of you may have read our Top 10 Tips for Amazon Connect whitepaper, and surely some of those same points will be represented below – but time and again, the following key learnings have been seen over and over as we’ve worked with some of the largest companies on the planet in their migration to AWS. First and foremost, Connect represents truly a new paradigm to control your own destiny. For decades, customers in the contact center industry have been beholden to black box, proprietary technology. The list goes for miles – Avaya, Genesys, Avaya, Aspect, 8×8, Nuance, Five9’s, etc – almost all of which run proprietary platforms where you must conform to their standards to modify and integrate in order to design the customer experience you so desire. Candidly, many of the customers we work with have given up trying to modify their customer experience and have chosen to conform to what is already built. It’s sort of like a silent submission realizing that getting a great customer experience isn’t really possible – so better to just do what’s least painful. Amazon Connect represents a different paradigm where we are beginning to see customers regain control of their customer experience and insert themselves back into the stream of contact center innovation. Connects tools’ allow most standard application developers to design, build, create and maintain customer experiences in the same ways they are controlling their web and mobile platforms. Forget open standards VXML. Instead, .Net, Ruby, Java and Node are the tools commanding the first generation of applications on Connect. This sort of freedom is far from normal in the contact center arena and it’s incredible to see how customer service might change now that businesses can retake the wheel and truly drive their own customer facing experiences. Secondly, and this one is going to sound ridiculous, but the allure of the cloud is finally starting to become a reality with Connect. For more than a decade, various providers have sold into the contact center space with great promise and hope for cloud based solutions. If I could count the number of TCO and ROI models that have been built in this time, it would probably equate to 20 quadrillion dollars in annual savings from just the models we’ve seen developed. That said, time and again we’ve seen customers struggle with unforeseen costs, unpredictable and unreliable uptimes and limited ability to truly eliminate embedded infrastructure that was bound to be removed once “everything was done moving”. The idea is awesome – the delivery has left something to be desired. Most commonly we hear of significant uptime and reliability struggles from most of our customers who were early adopters to the space. Most can live with a partial reality when it comes to TCO and ROI, but when it comes to stability and uptime, we have seen most of the major providers struggle to provide a product that is as reliable and consistent as a well-optimized premise deployment. Enter Amazon Connect – and for more than 12+ months, we’ve not seen a single customer outage. Usually one of the first things a managed services business does is learn how to escalate and troubleshoot outages. Interestingly, I’m not sure I could even tell you how great we are at escalating issues with AWS, because honestly, we just haven’t had to do it. Today we are supporting customers taking dozens of calls an hour and customers taking millions of calls an hour and in neither case have we seen any notable outage that has forced our teams to assess and visit high availability strategies. From a cost perspective, I’ll make one comment…. when talking with a customer recently, the question arose about what will happen when AWS raises prices. With great comfort, I realized what a unique position AWS was in, having essentially guaranteed that their prices will not increase. Honestly, that’s unreal. In our space (contact center), the market is constantly looking for new value or new benefits to justify the usual cost of living increases – and to date, we’ve already seen AWS reduce prices multiple times to the marketplace as their footprint and capability expands. Not only is this unheard of, it’s amazing to think where this will head, given we’re so early in the process. There are probably dozens of industries that are waiting on silver bullets. Those that come to mind quickly would include the self driving car, the truly delicious fat free pizza, the non-shatter smartphone, the perfectly straight golf club, the calorie free beer, a comfortable airline seat, the list goes on…. But more than any other industry, the allure of self-service driven speech technology is abundant in the contact center industry. Blame Siri, blame Cortana, heck – even blame Alexa – but the goal of “Say Anything” customer service has tormented and tortured the customer service industry for decades. Sadly, we have yet to see technology match customer expectations in even the best, most robustly developed applications and the peak of automated technology has generally been left at the feet of comedians and self-deprecating insurance companies willing to poke fun at their own technology deployments. All that being said, for the first time in a very long time, there is hope on the horizon. Amazon Lex, tied alongside Amazon Connect, has started to offer a glimpse into where automated customer self-service will lead. We tell folks all the time, NLU applications are a journey, not a destination and this is true for Lex today. That said, the pace of change, the adaptability of the platform and the openness of the development tool has already equipped our teams to create in weeks what would’ve taken months to develop in legacy platforms like Nuance. We are now starting to see Lex put control back into the hands of some of the sharpest application developers in the industry (removing control from black box engineers) and this step itself is driving change and innovation that the industry hasn’t seen in decades. Like every technology, Lex is still evolving and I’m sure we’ll see great evolution over the next 12 months – but the buzz is real and more than any other feature capability, Lex is driving rapid and robust adoption towards Amazon Connect. If you’re reading this blog or have taken any sort of look at Connect, then I would guess you’ve struggled with the inherent lock-in and roadblocks presented by the usual suspects of the industry. Writing that sentence, I realize this sounds sinister – and honestly, that’s not the intent – it’s just the way the industry evolved. As the technology leaders in our space have adapted and adhered to the growing demands of their customers, they’ve mostly done so in a way that aligns and supports their native technology stack. I don’t blame the approach, frankly, it was probably inevitable. Faced with customer demand, the easiest way to incorporate new features is to embed them into your current stack, the stack that got you in the game. But what this has inherently created is a series of siloed platforms that are virtually untouchable or unmanageable by any other resource in today’s enterprise. (When was the last time you asked your web team to update your voice menus?!) I understand that specialized applications are part of enterprise software (think SalesForce, SAP, MS Dynamics, etc) – but those industry segments all command significantly larger attention, driving servicing costs and capability back into the hands of the business. When was the last time you looked for a seasoned Nuance engineer and didn’t expect to pay $250/hr for their services? How about a Genesys expert? More than anything, Amazon Connect represents a shift in core thinking – a shift that will put control back into the development teams of today’s enterprise and slowly start to erode the high cost service silos that have orbited around the other major stacks in the industry. It’s been an amazing year. 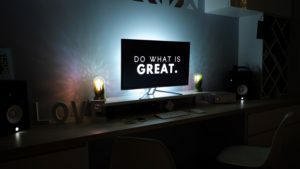 If you are reading this and wondering if the time is right to consider looking at AWS as a serious contender, I would ask one question….How much does great customer service matter in your business? If your business is like mine, it’s imperative. And if it’s really essential, then I would encourage you to give Connect a closer look. The opportunity to retake control and put change and evolution back in the hands of your sharpest developers, on the most stable industry on the planet, is worth your time!